Glade Park Community Service, Inc. There have been some questions concerning the proposed land purchase by GPCS. Mesa County has the option to purchase up to 10 acres for GPCS. How much land Mesa County buys is dependent on how much money we can raise. We would like to buy 10 acres. If we do not reach our goal of $45,000.00, we will buy fewer acres. The price was set between Mesa County and the landowner. November 1, 2008 is not an absolute deadline, but Mesa County is waiting patiently for us to tell them how many acres we can purchase. We want the land for the 4-H arena and bleachers which are now stored at the Pipeline School (Community Building). Our long range plan is to have space for a new community center, parking, and whatever future needs we may have. The Pipeline School, being a historic building, is not up to code, nor are we at liberty to remodel or update it. The Pipeline School will be kept as a historic building. We hope you will join your neighbors in donating whatever you can toward this purchase. All donations are tax deductable. Glade Park Community Service, INC. is a 501©3 non-profit corporation, which was formed in 1972 to serve the Glade Park Community. It currently manages and maintains the Pipeline School (better known as the Community Building) which was declared a Colorado Historic Site in May 1997 and is located at 1521 South 16 ½ Road. The building is used for community meetings, fundraisers, the Glade Park Bible Church, 4-H meetings, Crafters meetings and private receptions. The building is heated, plundered and is available to rent year around. •	To provide additional parking for community events. •	To provide space for our arena, bleachers and animal pens for the 20 boys and girls who are members of the Pinon Mesa 4-H Club to practice their events. •	To put on future fundraisers such as team penning, ranch rodeos and gymkhana events. We cannot continue to use the historic Pipeline School as a community building indefinitely. It is not up to County code, and because it is a historic site, we are limited as to what we can do to upgrade the building. Our hope is to eventually build a modern facility for the community on the 10 acres we purchase from the County. Our goal is to raise $45,000 in community donations by November 1st, 2008. This is the price for the 10 acres. In negotiations over the last year, Mesa County generously agreed to purchase acreage from the parcel and DONATE the land where the Post Office will be constructed. Mesa County also generously agreed to maintain the road to and from the Post Office year round. 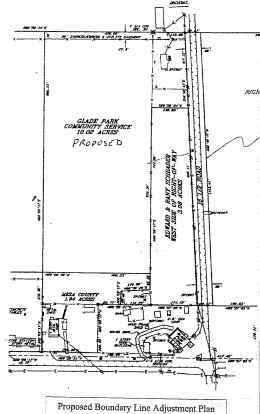 Finally, in order to streamline the process, the County agreed to sell pieces of that parcel to all the landowners who border the property in order to help expand the services the Community Center, the Glade Park Volunteer Fire Department, and the County Road Maintenance lot. Please help us bring a greater community spirit to Glade Park with your donation. All donations are tax deductible. Donations of $2500 or greater will be recognized on a plaque to be put on display at the Community Center. Please detach the bottom portion of this letter and mail in with your donation.